#1 What Do You Need to Clean a Gun? It’s important to maintain a clean gun because it ultimately ensures your gun is safe and reliable to use. But, there is no way you can adequately clean your gun if you don’t have the necessary equipment. That being said, here are eleven things you need in order to adequately clean a gun! One of the most important things you need to clean a gun is a soft cleaning rod. In fact, if your cleaning rod is harsh or low quality, it could ultimately damage your gun, which would have a negative impact on the resilience and overall potential usage of the gun. A general rule of thumb is to ensure your cleaning rod is only comprised of materials that are smoother and softer than what your gun barrel is made of, which is usually steel. Having a soft cleaning rod isn’t the only thing you need to worry about. In fact, the cleaning rod attachments should also be smooth and soft. The attachments you should purchase for your gun cleaning rod include jags and loops. These attachments simply latch onto the top of your cleaning rod. With the jags and loops, you will be able to adequately secure the next necessary item you need to clean your gun, which is a clean cotton patch. Like previously mentioned, you’re going to need a clean cotton patch to adequately clean your gun. While a soft cleaning rod and the proper cleaning rod attachments are important, the clean cotton patches are ultimately what cleans your gun. That’s why it’s important to make sure that you use a new and clean cotton patch each time you clean your gun. Even if you regularly clean your gun, and you don’t think your cotton patch got dirty, make sure you change the cotton patch each time you clean it. Even though you’re going to use a lot of cotton patches as your time as a gun owner, it’s important to note that they are usually inexpensive and virtually accessible everywhere. Also, cotton patches are versatile. You can even use them to clear dirt and grime from the external portion of your gun while you use it, or shortly after. Having durable cleaning brushes is also important. Just like your cleaning rod and cotton patches, your cleaning brushes will ultimately make your gun look and operate like it’s new. That’s why it’s important to have brushes that have just the right balance of softness and abrasiveness. A great brush material is bronze. Bronze is proven to adequately clean your gun while remaining in tip-top shape for a long time. But, that doesn’t mean that you won’t ever have to replace your brush. In fact, even the most durable and resilient brushes age over time, even after a few uses. That’s why you should consider purchasing brushes in bulk. Another thing that’s important to mention when purchasing bronze cleaning brushes is that a different brush should be used for each of your guns. Do not use the same cleaning brushes on multiple guns. This could ultimately damage the caliber of your gun. Much like gun-cleaning fluids, you can’t use a typical toothbrush you would use on your teeth, on your gun. That being said, it’s important to purchase a toothbrush that’s specially designed to be used to clean guns. Most specialized gun toothbrushes are comprised of materials like nylon and brass, which provide the perfect balance of softness and abrasiveness. With a specialized gun toothbrush, you can have peace of mind that it will clean every inch of your gun. Therefore, you will easily be able to utilize it once it’s clean. Let’s face it: there’s a lot of materials and equipment that go into cleaning your gun. That being said, the last thing you want to be doing is running around your garage or home in attempt to find one or two items you need to finish cleaning your gun. That’s why it’s important to purchase a durable organization bin that can carry and maintain all of the items you need to clean your gun. This organization bin will reduce the amount of time you have to look for your gun cleaning items, as well as act as a place to store all of the materials once you’re done cleaning. So, you can keep everything in the same place and access it whenever you need to clean your gun again. 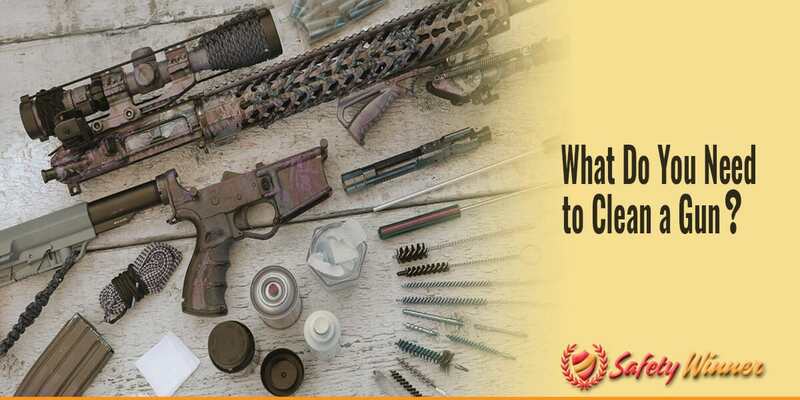 Even though most of the general tools you will need to clean your gun should be included when you purchase it, you might find yourself searching for an item you would find in a standard toolbox. This includes items such as a standard screwdriver. That being said, it’s in your best interest to purchase a multifunctional tool. A multifunctional tool is also something handy that every homeowner should own. This means you will most likely find yourself using your multifunctional tool for things other than cleaning your gun. The last thing you want to do while cleaning your gun is to hold it in an awkward position, or place it somewhere that’s not sturdy. While you’re cleaning your gun, it should be securely placed on something, such as a gun vise. Like previously stated, you’re going to need to use a few different types of chemicals and fluids to clean your gun. This means the place you clean your gun is probably going to full of strongly scented fumes, which could be nauseating or even detrimental to your health. That’s why you should ensure that your working environment has proper ventilation. One of the best ways to make sure the place is properly ventilated is by investing in a heavy duty fan. The last thing you need to adequately clean your gun is a clean and safe working environment. Cleaning your gun is an important and tedious task. That’s why it’s especially important that you are able to focus and remove yourself from any distractions. Also, you shouldn’t have to worry about any external factors interfering with your gun cleaning. That’s why a garage or shed is the perfect place to clean your gun! Also keep in mind that you are probably going to experience intense fumes. So, make sure your environment is equipped with at least one fan and window to stimulate ventilation.